events and courses via Social Media Marketing. • Reinvented Training and Events increasing revenue by 500% year-over-year. practices, policies, tips and strategies for child safeguarding and classroom management. • Created media assets that generate several thousand pounds in annual revenue. • Integrated media assets internally utilising Adobe Captivate saving company expenses. Created and edited nationally televised broadcasts for Fox Sports and MTV Network's SpikeTV while meeting exacting production standards often on a very tight deadline. Produced engaging content for digital, streaming and DVD formats. Script writer for presenters and show voice overs that were consistent with the UFC ethos and legal requirements. Pioneered and helped build Production Team into the largest UFC department. Produced shoots for national news broadcasts and corporate trade shows, conference and convention speakers. Videographer and editor for reality show pilot, product and service web videos. Encode and transcode client videos for web and DVD. Wrote technical and training video scripts and interviewed corporate CEOs on camera for client websites. Recruit, train, and supervise alternating teams of volunteers for weekly live event production. Director - weekly multiple camera live music and speaker production, including 4 camera operators, technical director, character generator, and shader. Team building through "Video Production" classroom instruction. Train staff and volunteers in camera operation, technical directing, character generating, and DVD production. Coordinate and assist with build-out of live video control room. Team builder and trainer - multiple live production crews. Supervise production team of five paid staff and 21 volunteers for multimedia production - Live Video, Television, Web, and DVD. Recruit and train alternating production teams consisting of camera operators, technical directors, character generation, and editors for weekly multiple camera live event shoots. 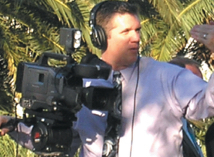 Instructor and curriculum developer for International Bible Institute course "Video Production 101". Producer for weekly television program "2020Vision" - Established shooting locations, assigned production roles to editors and videographers. Writer, videographer, and editor for weekly fundraising promos and ad spots. Field videographer and editor for International speaking engagements: Mexico, India, Sri Lanka, Singapore, Malaysia, and Thailand. Supervisor for multimedia department consisting of 5 paid staff and 21 volunteers. Producer - weekly television broadcast "2020 Vision"
Manager multimillion dollar sales territory consisting of printing companies, hotel printing departments. Secured profitable new business via cold calling, prospecting, and customer-facing meetings to present the Unisource value proposition to senior executives. Exemplary customer service to ensure client satisfaction with delivered product. Focused on relationship building with clientele as a trusted advisor or consultant to medium and large accounts in an effort to increase Unisource market share. Supported clients by connecting print company owners with paper manufacturers representatives in onsite meeting. Instructor and Curriculum Developer for "Paper Course 101" seminar presented to graphic artists. •	Received "Judges Award" in 2001 for film entry into the UNLV annual film festival. Nominated for National HD Home Entertainment Award for work on "UFC Ultimate 100 Fights" DVD and Blu-Ray Box set. Masters Award. Unisource Worldwide. Top divisional performer for superior sales margin. Professional Sales Award. Unisource Worldwide. Top divisional performer for superior sales margin. • UFC 70 - UFC 170 DVD releases. • Wrangler Jeans, New Balance, Nautica Shoes, Nestle Water, LG Electronics, IHOP Restaurants. • Miss Teen Nevada Pageant. • Narrative Short Film “Thor At The Bus Stop” People’s Choice Award, Cinevegas 2004, “Robbing Peter” Edinburgh Fringe Film Festival, 2002.